Some of you may have noticed that I missed last week’s happy day photos. No, I have not stopped taking my photos, rather we were just away enjoying a long weekend mini vacation. Which meant I was busy enjoying a very happy weekend and of course taking tonnes of happy photos. In fact, I took so many photos that I have struggled to pick my favourite happy moment from each day. Anyways, here are the photos I should have posted last Sunday. And, as an added bonus, I will post this week’s happy day photos tomorrow when I will return to my regular schedule. As always, I hope you enjoy the photos as much as I enjoyed each moment. 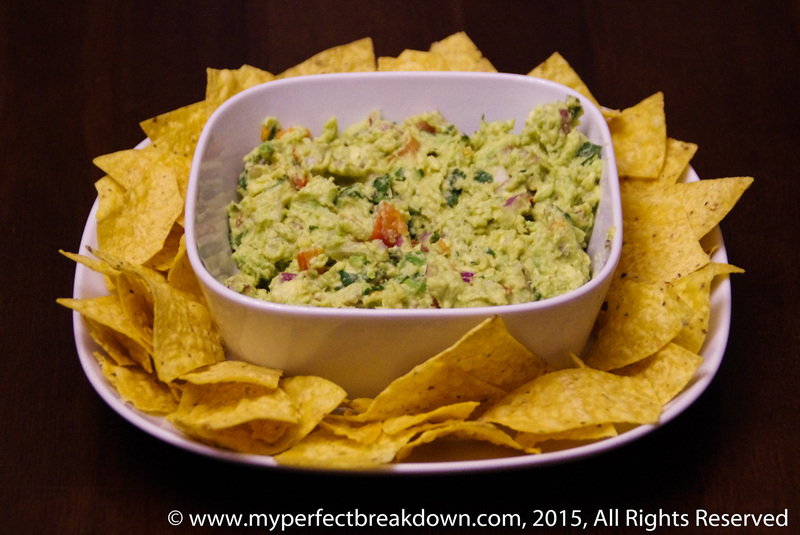 Day 216 – February 7, 2015: After enjoying fresh guacamole at a Mexican restaurant a few days ago with friends, we decided to try making some at home. We had a fun chopping up the vegetables, mixing everything up and we were definitely happy as we ate it. 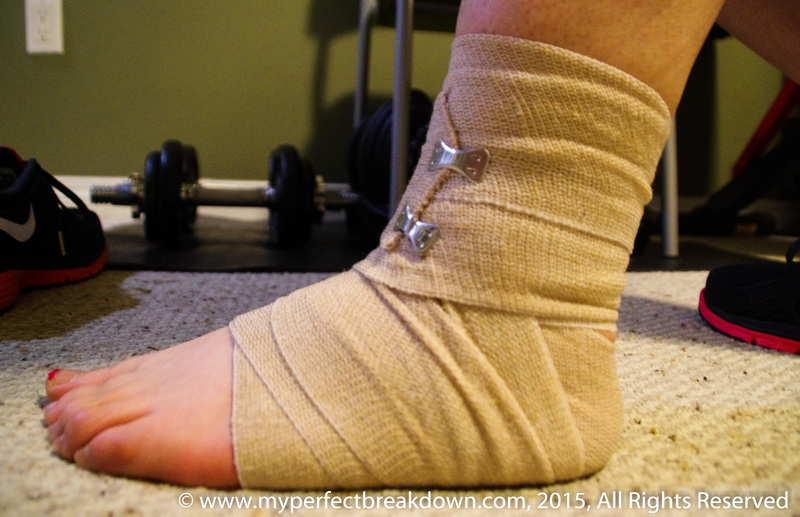 Day 217 – February 8, 2015: I discovered the near magical benefits of wrapping my high ankle sprain in a tensor bandage today – I felt about 1000 times better almost instantly and was even able to complete my full lower-body workout! This was definitely a happy moment! Day 218 – February 9, 2015: We knew this would be a busy week, so I decided to make a giant slow-cooker full of venison chili. And as a treat I picked up a loaf of sourdough bread (I love sourdough bread and rarely buy it because it’s not particularly healthy). 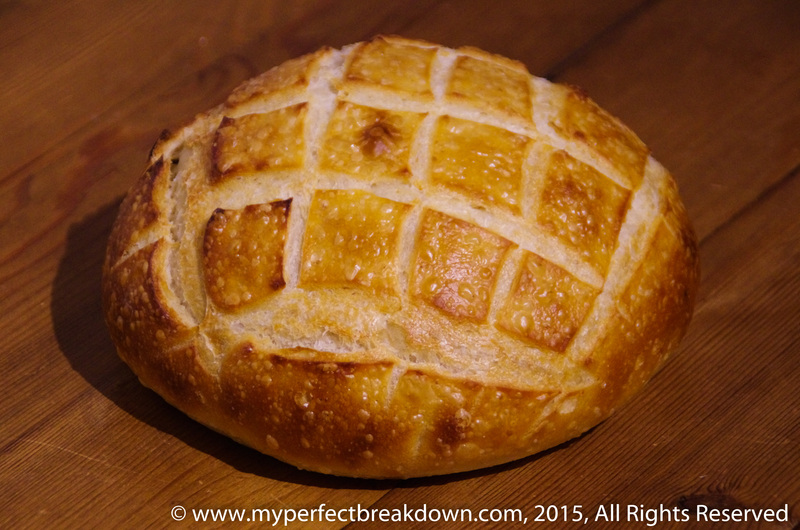 The chili was good, but I think I ate more of the delicious bread then the chili! 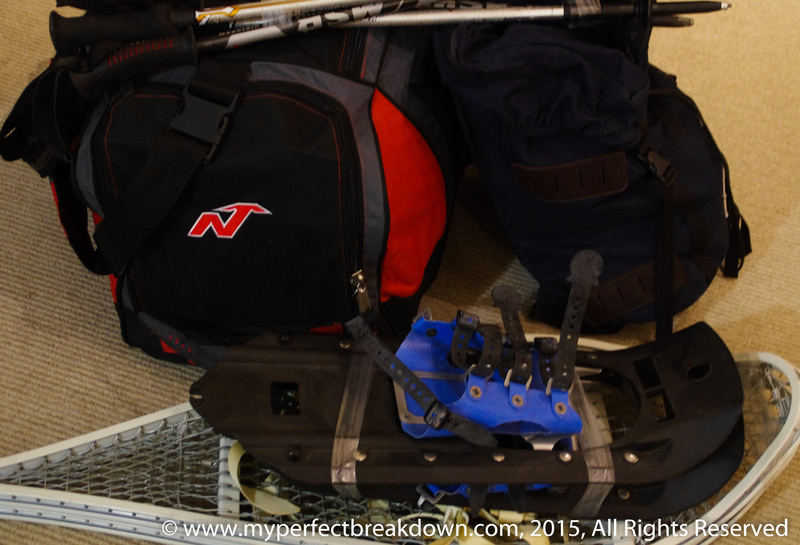 Day 219 – February 10, 2015: Tonight we packed up all our winter toys for our weekend away. I’m getting excited!! 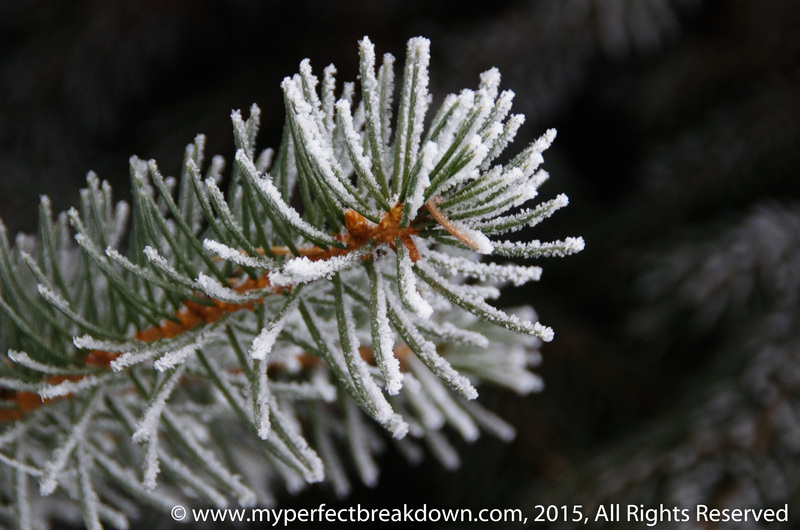 Day 220 – February 11, 2015: We enjoyed a relatively quick blast of winter today, and I was so struck by the beauty the lightly snow/ice covered tree in our front yard that I bundled up and went outside to snap a few pictures. Day 221 – February 12, 2015: Winter weekend get-a-way! We flew to Vancouver, British Columbia and started enjoying immediately. First stop, Granville Island to buy wild sockeye salmon and salmon jerky. Granville Island is one of my absolute favourite places on earth, and I love wondering aimlessly taking in all the sights and sounds. I chose this photo as my happiest one because I love how this bench at a bus stop looks today, and how it will likely never look exactly like this again. Creativity at its finest. Day 222 – February 13, 2015: No Friday the thirteen blue for us. We spent the day wondering around the Whistler village with our friends. 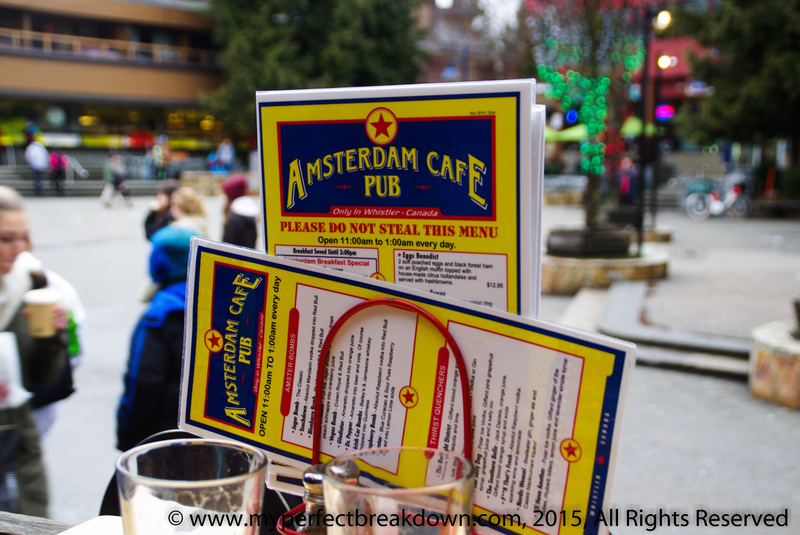 My happiest moment of the day was an afternoon stop at the Amsterdam Pub (our favourite pub in Whistler) for a few drinks (blueberry tea and amaretto for the girls and a local beer for the guys), some great conversation and some fun people watching. We all had so a great time! To check out my happy photos from the rest of our long weekend in Whistler & Vancouver, come back tomorrow! Wishing everyone splendid happy moments! As much as I’ve complained about our winter weather, it is beautiful. The ice makes the trees look like they’re covered in diamonds. Glad you had a fun mini vacation! Your gualc looks delicious! And also, how do you make your venison chili? I’ll make it again and write down the recipe to share it with everyone. It’s so easy, makes the whole house smell delicious and it’s really just yummy! Granville Island is also my absolute favourite place too. As kids, we used to buy seeds and feed them to the pigeons along the waterfront. Now, as an adult, I have a totally different experience there. My birthday post for DW has a picture of us at Bridges. It looks like you’ve had an amazing week! We used to do the exact same thing as kids whenever we were in Vancouver visiting family. And, I loved the kids market because you could go through the little door! And yes, we had an awesome long weekend. More pictures are coming tomorrow. Omg! I LOVED the Kids Only Market. Whatever happened to it? It’s still there, the same as it was when we were little. In fact, I’m not sure they have put a fresh coat of paint on the building since we were kids! Amazing. 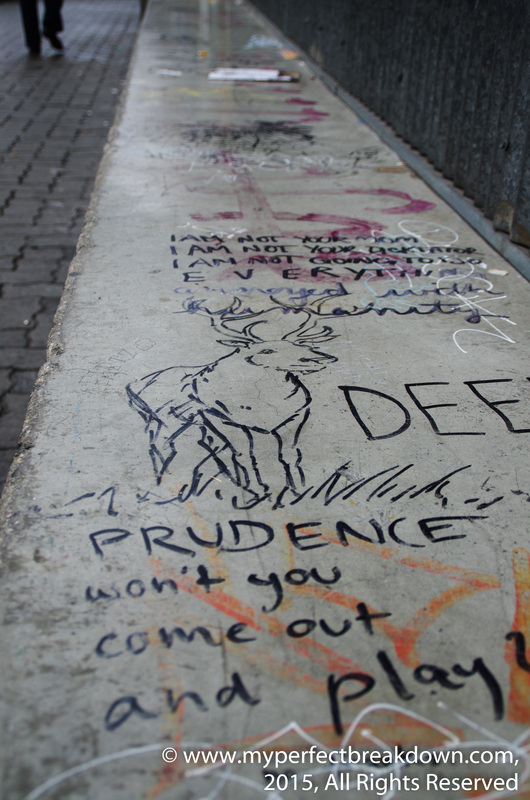 I love the bench with Beatles lyrics. You have a knack for capturing moments! These posts always remind me that there are so many special and profound moments in our busy lives. Glad you had a fun getaway! Thanks so much, I’m flattered by your compliment. Love the pictures! It just shows how even the smallest things can bring us happiness. 🙂 Keep enjoying the small things! Granville Island is one of my favourite places on earth too. My friend and I have several requisite pit stops in the market in particular. I also love shopping for art supplies at Opus. The rats on the rocks below are about the only thing that made me cringe but they haven’t been there the last few summers when I’ve gone. I don’t know what that means and prefer not to think about it. So glad you’re still taking and posting pics! We always stop in Opus, they sell my favourite pen so I always drag Mr. MPB in. I don’t remember the rats on the rocks, which is a good thing because I’d never go back if I did! Ha ha. I’m not so fussed about rats. We had them where I grew up snd I saw some as big as bunnies my first time in the East Village in the early 90s so modest west coast rats seem friendly by comparison.